The coral reefs off the coast of Key West abound in an incredibly diverse collection of aquatic forms of life, not the least of which include over a dozen species of native shrimp. Let’s take a look at a few of the better known species that you just might get a glimpse of during your Key West snorkeling adventure. As you explore the coral reefs, keep an eye out for a small species of shrimp with red and white striped claws inhabiting tucked away crevices in the area. 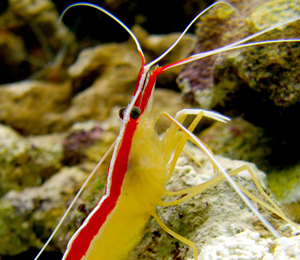 Known as the banded coral shrimp, this critter has a curious relationship with some of the local fish. When a fish swims close enough to it’s crevice, it pokes out to feed on the parasites and other detritus clinging to the fish’s head and mouth. One of the most well known species of shrimp that are native to the area is the famous Key West pink shrimp. These wild shrimp live off the coast in a habitat that is not home to many other species of shrimp, meaning that less desirable shrimp are unlikely to be caught by mistake or wind up on a diner’s plate. Key West pink shrimp are treasured for their succulent, sweet meat with shells that peel off remarkably easily when they are cooked properly. Although it has presented a problem in our area, the black tiger prawn is considered a popular species for culinary use in many parts of the world. It can be spotted by the distinctive black stripes found on the back of its shell and its large size. Adults are known to grown over a foot and length and may weigh over 20 ounces.